learn a bit about woodworking. Whether you are a professional or just starting out this month’s topic will have something for everyone. Mark Voight will be presenting Basic Woodworking on the 21st. 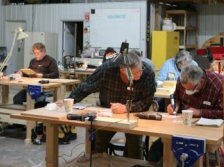 This meeting will be a bit of a high level overview of the paid three evening course he is teaching, but still show many of the basic things you need to know in woodworking. Our next meeting will be held on February 21. Don Peterson and Tim DuBois will be teaming up to give a presentation on the basics of hand tools. With power tools so readily available the art of hand work kind of slips away, but hand tools do have a lot of value to keep in our shops. Our next meeting will be held on January 17th and we will be getting a presentation from Michael Lauer on Leaded Glass. It will be fun to learn about and hopefully apply onto some of our future projects. When we can combine our different crafts together it opens up our minds for many different opportunities for design. Sometimes all we need is a little bit of inspiration. Our next meeting will be held on December 20th at 7:00pm and we will be celebrating the end of the year with a potluck party. Everyone and their significant other is invited to the fun. Please bring a dish to share, there will be plenty of power so we can have lots of crock pots. I know I will be bringing a crock pot of chili cheese dip. We will also be having a silent auction where the proceeds will be going towards the CMWA to help fund future events, hands on activities, and new tools for the shop. If you would like to help out please bring along items that you would like to sell - they can be any shop related items or even wood. Our next meeting will be held on November 15th at 7:00pm and it will be all about safety! Now safety may seem like a topic that we just want to quickly glance over like an owner’s manual of a brand new tool, but much like reading the owner’s manual after the tool is wrecked we don’t want to find out what we did was wrong after we have gotten hurt. This safety meeting will be the official kickoff for the safety program at the Tech Center. Going forward, in order to operate any equipment you will need to pass the safety test - no worries it is an open book test, and with a little bit of common sense you will be able to pass no problem. Our next meeting will be held on October 18th at 7:00pm and it will be completely hands on! Rollie Johnson will be showing us how to build a shooting board. A shooting board is a handy tool to keep around the shop, and once you have used one a few times it will certainly prove its worth to you. 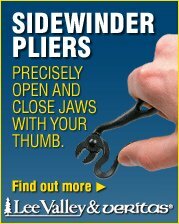 It can be used to clean up the ends of a cross cut and slowly shave down an end until it’s the perfect fit. We will be assembling ten shooting boards for the CMWA shop. If you would like to build one we have a materials list included on page 6 of the newsletter.